For about a decade now, we have been endeavoring to help people manage information and create knowledge. Our key research area however is to invent tools and interfaces to apply this knowledge to everyday life. With widespread adoption of GPS powered super smart phones that are always aware of their physical location in the world, a whole new plane of possible ideas has emerged. While working closely with Cyn.in customers we realized the importance of geo spatially relevant knowledge in Cyn.in. Diving deeper, we knew a lot of our ideas in this field were far from being limited to the needs of only a knowledge heavy enterprise. We have always been a proponent of separation of interfaces from services, something that is usually a difficult sell in the web dominated world, but we found these principles to apply perfectly in the smart phone market, where niche interfaces are the need of the hour and broad, all purpose interfaces to services just do not work for everyday use. After putting one such idea through a couple of initial design cycles, we knew what we held in our hands, applied to a much, much broader audience than most mobile applications out there. To make our point, we decided to start with applying this interface to the largest services providing geo tagged information globally. The result, Localscope is probably one of our finest creations that will be appreciated and needed by possibly every smartphone user in the world! Though to begin with, only iPhone users can get their hands on it. We chose to start with the Apple iOS platform as we believe it is unarguably the best suited for our vision in terms of technology, marketplace and target audience. Our vision with Localscope is to let people reference the enormous (and rapidly growing) wealth of geo specialized information contained in search engines and social networks quickly and easily, without having to figure out each of these services independently. Our goal for Localscope is to be the most intuitive search and browse interface to geo specific content and evolve the way people discover their vicinity. We see Localscope as a unique new tool; a ‘vicinity browser’ specialized for browsing information around and about the physical location of the user. 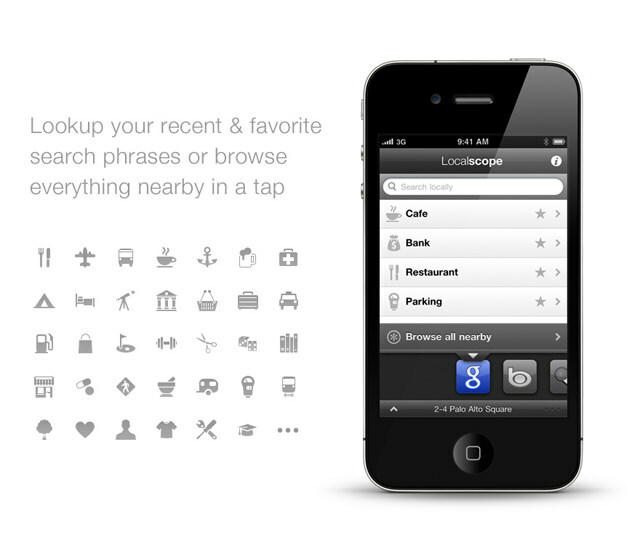 To learn more about what Localscope can do, check out the product page. Localscope is now globally available on the Apple Appstore, for an introductory launch price of US$0.99 (or the equivalent in other currencies) so go get it here. We hope you enjoy using it as much as we enjoyed creating it.